As the technology owns a new look day after day, each and every task is being carried out with the help of technology. There was a time when hard copies of books were required to grab knowledge about any interested topic. But the problem occurs when a person have to carry such books along with him during a journey. Science and Technology had solved this problem too. With the invention of Internet, the hard copies were less preferred and soft copies were focused mainly. Now every person seemed to have their important documents on cloud space that can be used anywhere. But the question still remains the same i.e. “How to handle books during a journey?” For a novel lover, this was a big problem. So the invention of E-Books took place. Here we are giving the top five best E-Book Reading apps. The books can be read on tablets, Smartphones and other gadgets. 1- Aldiko For Android: As about 80% mobile phones in this globe runs on Android, Aldiko has come out as the top level application for e-book reading. Till now according to the official website of Aldiko, 2 million downloads of this app has been done which is really an impressive number. You can browse and download from thousands of FREE classics and modern works and read them. 2- Kobo: It is the second ranked e- book reading app. It is an e-link reader sold by Indigo Books and Music and Borders Books. This app is freely available for Android, iOS and BlackBerry 10. What makes the users use this app is the badges that are provided to them on the basis of their reading reputation. 3-Kindle: It is a paid app available on android, iOS, BlackBerry 10 and Windows Phone. It is equipped with a synchronization feature that enables the reader to start from the point from where he left the book. The desktop application of this is also available which helps to read the book even on the desktop from the same page he left on mobile. 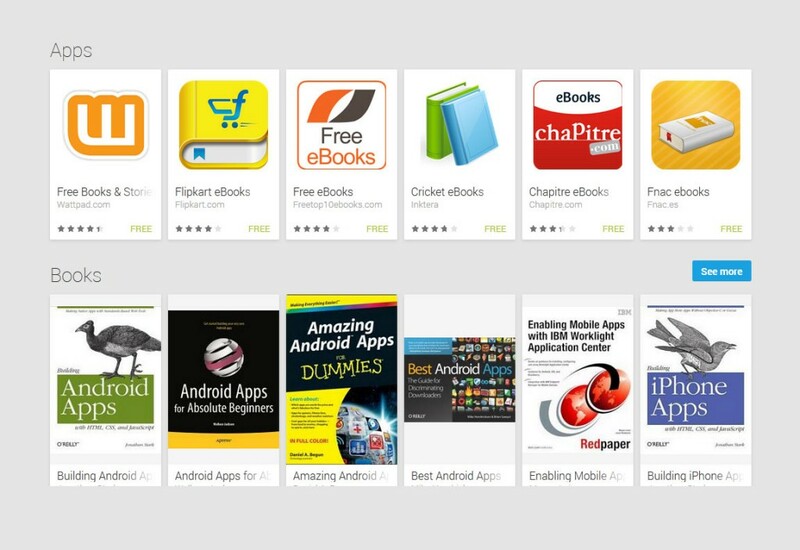 4- Google Play Books: This is a default Android app which was initially not having many features. But now the basic features are added to this app like bookmarks, dictionary, notes, etc. This app is also having a good user reviews after its up-gradations. 5-iBooks: It is one of the iPhone dependent applications. This app has not appropriate no. of users in India. But apart from this, this app is still having the top class reading experience. The latest iOS7 update of this app is installed with even more features. Download all apps from Google Play Store.